Here is what a Presentation with Blurbs looks like. 3) The new space will be inserted into the presentation on the right side, you should see a new bar in your Section Editor on the left hand side. 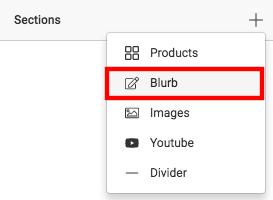 4) Click in the space that says "Click here to edit this blurb" to add text, images and videos to the Blurb. Click the "X" on the top right corner of the Blurb Section. 2) A pop up will ask you if you want to delete, select "Yes." 3) Alternatively you can click on the pencil icon to right of your Blurb Bar and hit the trashcan to delete the Blurb Section.